Although I’m no expert on travelling, I can imagine there are varying difficulties from place to place when it comes to making and keeping friends. I thought about this while I walked along a forest path flanked by woodland mounds of purple and green in Miharu, Fukushima. 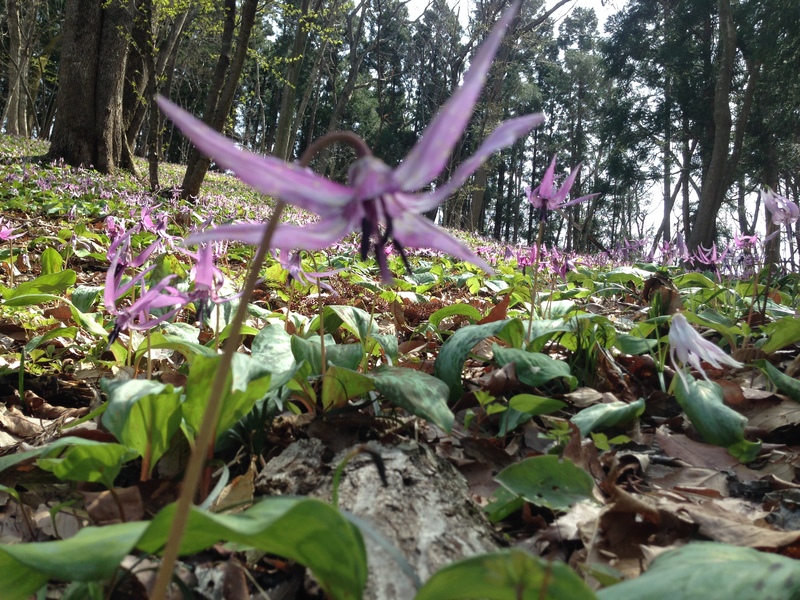 A woodland slant filled with Erythronium. Controversially regarded as a vulnerable species, Erythronium japonicum – katakuri in Japanese, generically known as trout lily in English – can take some years before it blooms and seeds. It’s also fairly needy, preferring slightly acid and well-drained soil and precisely the dappling light I felt that day in “Three Springs” (Miharu was gorgeously and aptly named for the three major trees that pop up sequentially in Springtime: plum, peach, and cherry). An ume, or plum, blossom in Miharu. 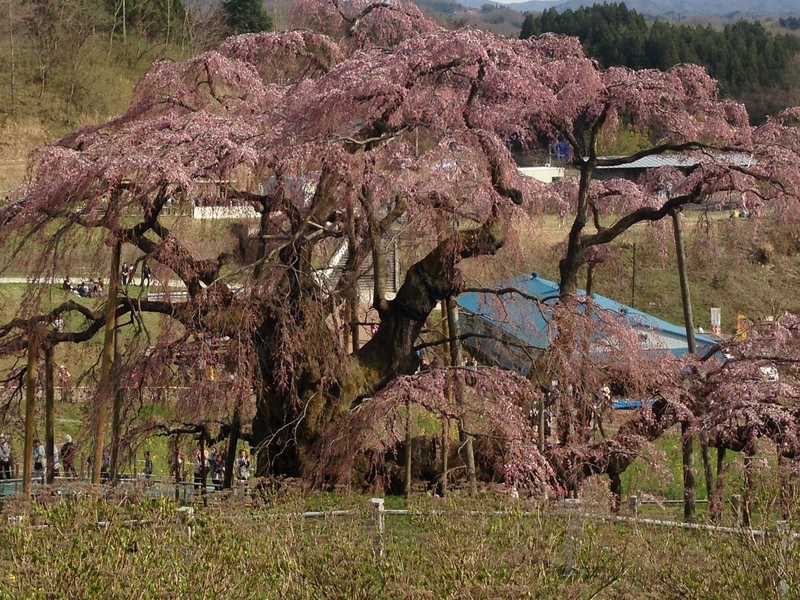 When it comes to years of cultivating, however, the monolithic mother of cherry trees, Takizakura, or waterfall tree, deservedly takes the cake. She’s over 1,000 years old and attracts hundreds of thousands of nature-lovers each year. Takizakura, mother cherry tree of Miharu. 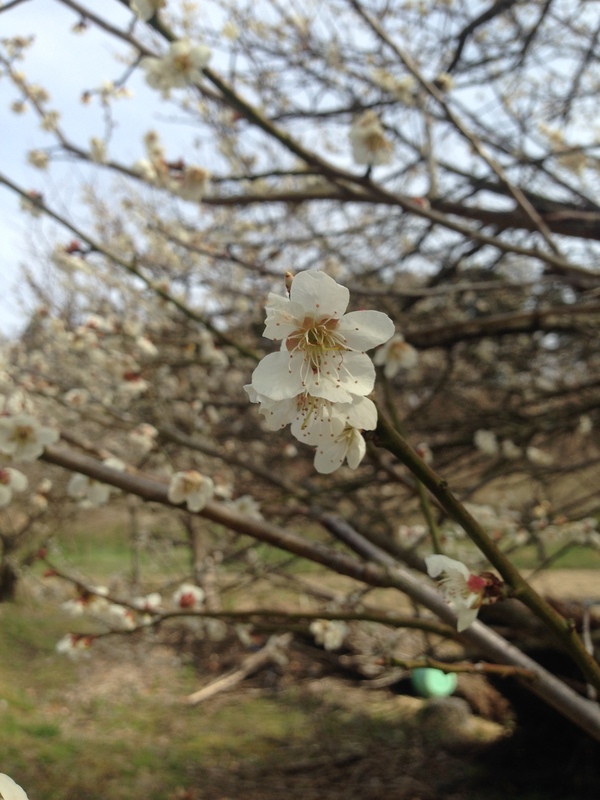 While it’s unthinkable that the government and gardeners here would ignore such a threat, it concerned me – and my excellent guide and friend that day – that the cherry and plum trees lining the backroad to Mama-zakura are all infected with the same disease affecting those on Hanamiyama in Fukushima City. The same black rot that starts within and eats its way out. 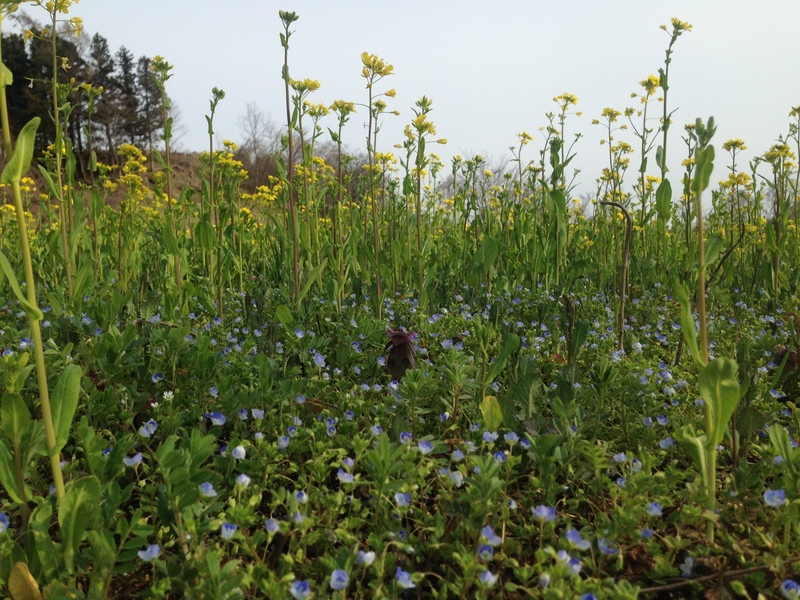 A field of nanohana, or rapeseed, in Miharu. It’s been studied for some years as a veritable bioaccumulator. While everyone in the know about the quickly spreading disease here would love to see a cure-all rather than a cut-down-and-wait-and-see method offered by a plant pathologist expert, this is clearly something inevitable as well as something that will take some time to fix. Given the importance of cherry blossom viewing in Japan and the love of nature here, one can hope this fix will come before the disease sinks in too deep. This entry was tagged カタクリ, botany, cherry blossom tree, 片栗, disease, Erythronium japonicum, 郡山市, Fukushima, Fukushima City, Fukushima prefecture, hanami, Hanamiyama Park, Japan, Japanese, Japanese plants, katakuri, Koriyama, Koriyama city, Miharu, plants, Takizakura, travel, 三春町. Bookmark the permalink.